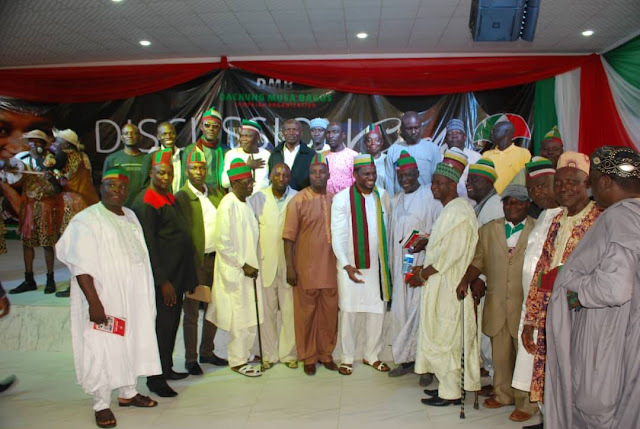 Precious Nyako|| Berom and Afizere Unity: Dachung Bagos has Broken a Record! To the amazement of the crowd gathered at Sarau Center yesterday, Dachung Bagos came up with a unity fortifying idea, one of its kind in the history of Plateau State! A unity cap and muffler comprising Berom symbolic colours on one side and Afizere symbolic colours on the other. From the berom nation Da Markus Pwajok (former commissioner of Agriculture), Da Julius Vwah (Former Deputy Chairman PDP Jos South LGA & ex officio, Plateau Northern Zone of PDP. The elders decorated each other with the new unity attire, cheerfully hugging each other as the cheerful crowd gave celebratory applause. Dachung Bagos then knelt down as the elders joined their hands to decorate him with the new unity attire. Bagos made it clear to the crowd that he is taking these steps not for political reasons but rather for the peace and unity of the constituency. In line with his motto, he is establishing a foundation of growth, development and unity, that will outlive him. "One of my main agenda is to unite the Berom and Afizere people" Bagos said. According to Bagos, By God's grace when he gets into office as the reps member, that would be his key mode of appearance. The caps and mufflers were given to a good number of people as a gift. Immediately, the colour at the event changed as people proudly wore the new, unique unity attire.